Damn. The ground looks so far away. “This crazy altitude is going to give me a nosebleed,” I tell Rio. Rio’s in the left seat. I sit up straighter in my seat to see out over his wing at the airport, far, far, far below. “Break out the oxygen,” I insist. Which, I know, means we’re 5,791 feet above sea level. The FAA doesn’t require pilots to use oxygen until we top 12,500 feet, and then only if we stay up there for more than half an hour. It’s at 14,000 feet that the pilot must don the mask no matter what. I’m not sure what Tessie’s service ceiling is, but I’m guessing we couldn’t get to 14,000 feet even if we filled her up with helium and lashed her to a weather balloon. Still. The airport looks too small. In my mind I chant:I do not like green eggs and ham. I do not like them Sam-I-Am. I do not like this new pattern altitude. I would not like it here or there. I would not like it anywhere. After I’ve been flying a landing pattern altitude of 800 feet above the ground for thirty-seven years, the powers-that-be have gone and raised it to 1,000 feet. It actually isn’t as capricious as it sounds. For years about half of the non-towered airports out there have used my beloved 800 feet, while the other half have been using 1,000 feet. As there’s no way with a quick glance at the chart to know which an airport is using, it’s led to a dangerous mix of aircraft flying at different altitudes in the pattern at some busy airports. So really, they had to standardize it for safety. I just wish they’d chosen 800 feet. But they didn’t. And now I have to learn to land all over again. As do Rio and Lisa, who were just beginning to master buttery smooth landings from 800 feet. Now, it seems that no matter how we change our power settings, we still come in 200 feet high. Of course, the new pattern altitude isn’t actually law. It’s a highly recommended best practice recommended by what’s called an Advisory Circular. Out here on our own we could just keep doing whatever the hell we want to do, and no one would be the wiser. It is for the best, I can see that. Plus when we travel we really need to be on the same page as everyone else. We—I—just need to buckle down and learn how to do this. 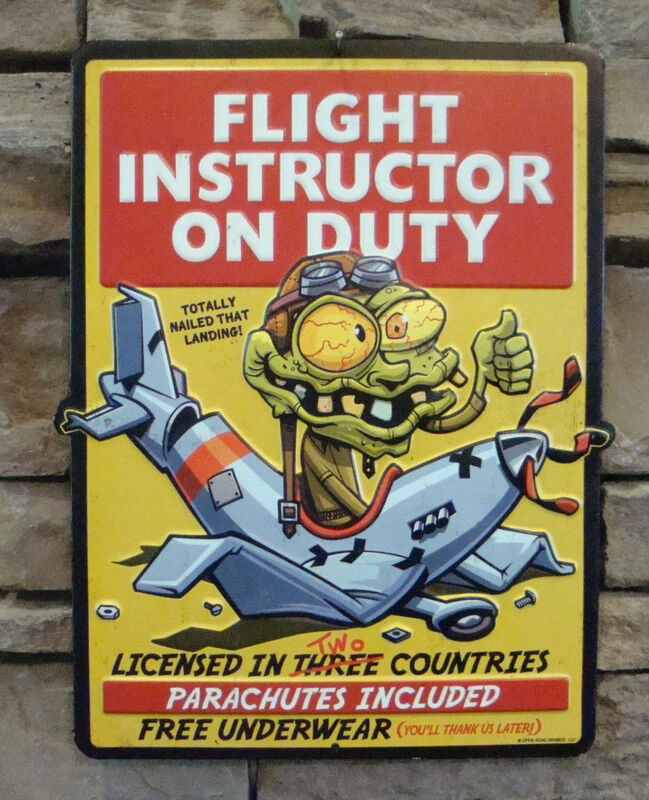 Flight instructors: The good, the bad, the ugly, and me? I’ve taught my pair of copilots a lot about flying. In fact, both student pilot buddy Lisa and student pilot son Rio fly better than I do. If by flying you mean keeping the airplane on course and at altitude. Rio is also pretty darn good at pattern work, while Lisa is an S-turn queen. And both of them have managed a respectable take off or two. Neither of them, however, can land. Which is totally my fault. You see, I’ve never taught them how to. Why’s that? Well, I’m not a certified flight instructor. Not that I didn’t try to be. 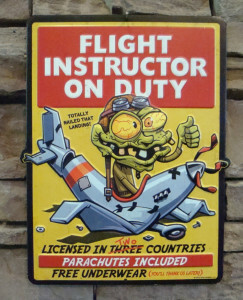 I even trained to be a certified flight instructor. I was sporting a brand new leather flight jacket and oversized mirrored sunglasses when I pulled into the airport parking lot. The day was to warm for the jacket, but I had to look the part. As a freshly minted commercial pilot, I was there for my first lesson on how to become a certified flight instructor, which is what you did in those days as soon as you realized that—even though you had a license to get paid to fly—no one would hire you until you banked more flight time. A lot more flight time. Come to think of it, that’s still true today. The only difference is that nowadays this is no secret. Back then, it came as a bitter shock to me and my fellow wet-behind-the-ears commercial pilots. But even though I didn’t understand the realities of flying jobs, I did know quite a bit about flight instructors. I had a number of them during my journey from first flight, to first solo, to student cross-country, and on to my private pilot’s license, instrument rating, multi-engine training, and finally my commercial ticket. Most of my instructors were OK. One was good. One was bad. But one was nothing short of amazing. The amazing flight instructor was one of my professors at Aims Community College where I was a student in the aviation program. His name was Gil Harris. He’d flown Corsairs with the Marine Corps in the Pacific during World War II, and then flew pretty much everything with wings in the years following the war. He was a small, compact man with twinkling eyes and a neatly trimmed Royal Air Force-style mustache. What little hair he had left was gray. He was modest, kind, and funny. His teaching style was magical. I learned more from that man than from all my other instructors combined. His knowledge and experience were boundless. Endless. Among other things, he taught me mountain flight, hugging towering cliffs in the heart of the Rockies to catch lift and soar like an Eagle. It was Gil who signed me off for my commercial check ride, and I was tickled pink that he agreed to train me to be a flight instructor—just like him. I would be 21 years old in just four days. Naturally, I thought I knew everything as I walked across the tarmac to meet Gil at N48751, a blue and white Cessna 152-II. But the Gil Harris that was waiting for me wasn’t the master aviator I was used to. Nope. It was Gil the Hillbilly. I guess I was expecting some sort of inspired intelligent conversation between a motived student and a master, with me being the master. That didn’t happen. That night, I lay in my waterbed (remember this was 1984, a time when phones were attached to walls, there was no internet, and people slept on thick plastic bags filled with water) and tried to make sense of the day. I replayed the seven-tenths of an hour lesson again and again in my head. All the clever teaching tricks I had dreamed up to cultivate the next generation of pilots fell flat on their faces when faced with Hillbilly Gil. I was shaken to the core. I felt stupid. And I wondered: Was Gil trying to prepare me for real world flight instruction, or was he showing me that flight instruction wasn’t for me? Next, I thought back through every instructor I’d had on my own aviation journey, and I realized that the younger ones were the worst, and that the older ones were the best. It made sense. How can you teach when you’ve really just begun to learn yourself? I never went back for a second flight instructor lesson. In later years (and to this day) I wondered if Gil was just trying to take my ego down a notch, or if he felt I didn’t have the Right Stuff to be a flight instructor, and knew me well enough to know how to scare me off. Or was his first flight instructor lesson with me the only instructional failure of his life? The bruised ego of my former self would like to believe that, but I doubt it. After all, he never called me to ask why I hadn’t scheduled the next lesson. But it was moot. The seven-tenths of an hour that September morning changed the course of my life. I tired for several months to find a flying job. Any flying job. But none were to be had, and in the end I stopped flying for many years. Of course, I’m not four days short of 21 any more. I’m well over the five-decade mark. I’m on my second logbook. And I don’t wear a leather jacket when it’s too hot. I’ve spent much of my adult life (in addition to writing) teaching in one form or another. 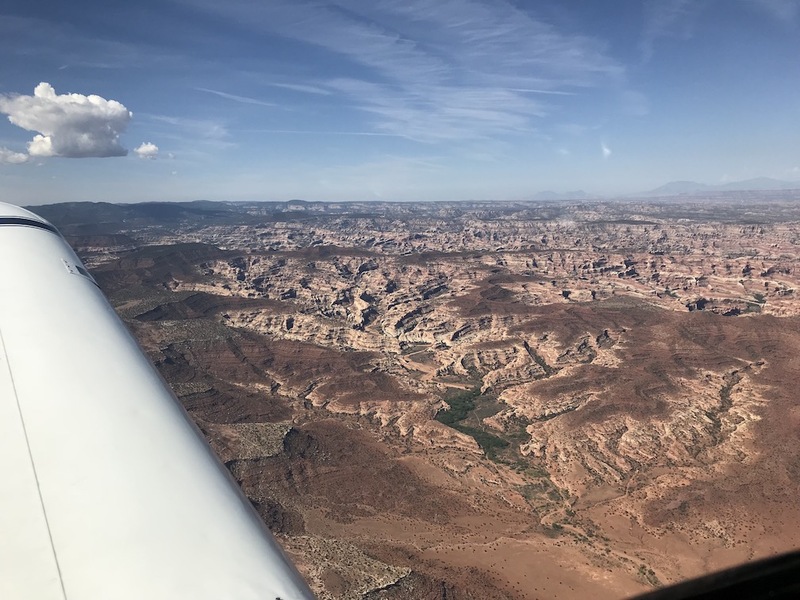 But I know that having extensive aviation knowledge and experience—and knowing how to teach—is a very different thing from knowing how to teach people to fly, much less land. Or that’s what I told myself. But my self-imposed limitation may have been a justification. 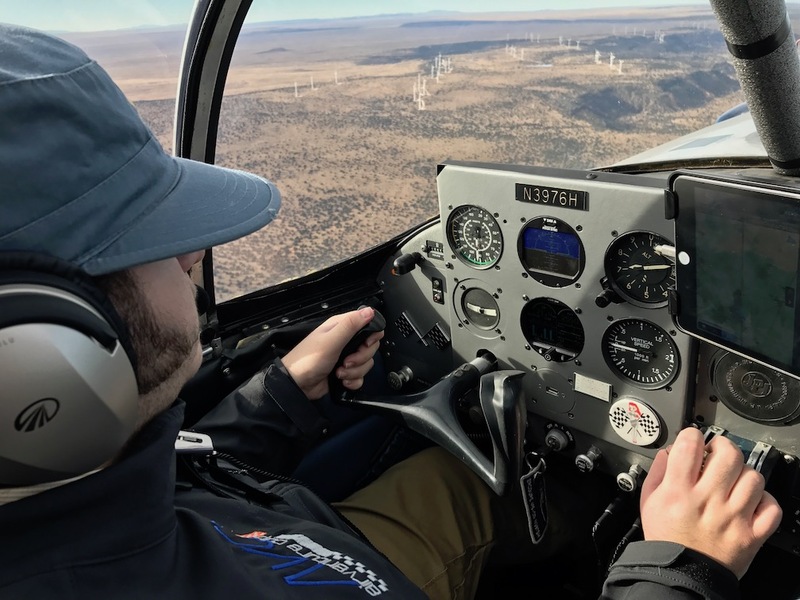 After all, there’s actually nothing illegal about teaching some elements of flying to others while not being a certified flight instructor yourself. Plenty of pilots teach regular non-pilot passengers how to control the plane, communicate on the radio, and even land just in case something should happen to the pilot (this unofficial flight instruction can’t be logged, nor can it count toward a license). In truth, it wasn’t the lack of official certification that held me back. Being a flight instructor school dropout, I just didn’t have a clue how to teach someone to land, and my own learning to land is lost to me in the mists of time. I just don’t remember how I learned to land. 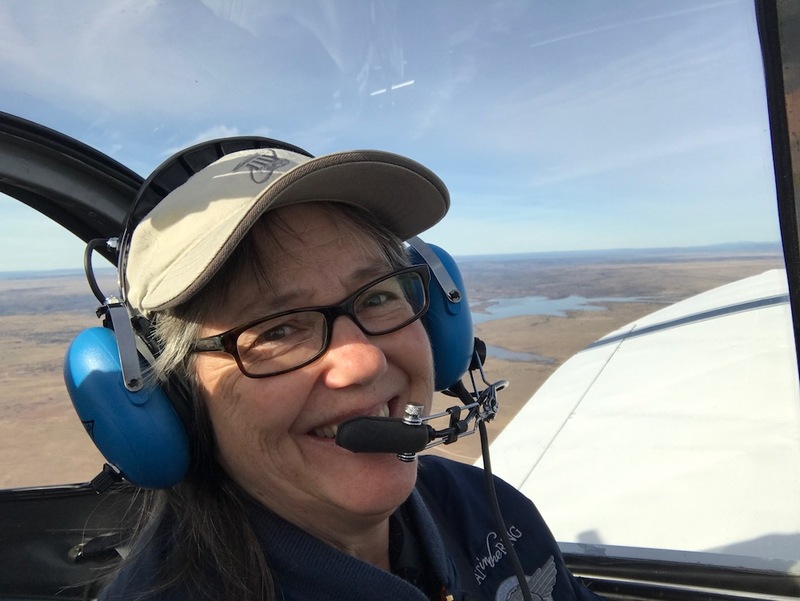 About the same time that Rio’s instructor left for the airlines, Lisa went off to North Carolina for an intensive all-day, two-week training course that was to cumulate in her Light Sport check ride. She left enthusiastically. But her enthusiasm was quickly squashed. Each night as she FaceTimed in to update us, she was increasing depressed. First off, the weather sucked. The cold she expected. She grew up in that neck of the woods. But the record snow was making her flight training a challenge. As was the fact she was flying off of a grass strip, a minor little detail the one-man flight school neglected to mention on his website, along with the fact the tail-dragger training plane had no electrical system and had to be hand-propped to start. The worst of it was the flight instructor himself. Each time she’d ask a question he’d say, “Figure it out for yourself.” He was also 100% negative, pointing out every less-than-perfect action on her part, while never giving any supportive encouragement. OK, I agree that there are times when it’s good for a student to figure things out for themselves, but good teaching also entails some guidance. And motivation. When flying I can see that there are times when an instructor must point out errors so they can be avoided in the future. But I also think that maneuvers performed well should be supported to keep morale up and to give the student as sense of improvement, not to mention encouraging good flying skills. But for Lisa that never happened, not once, and with each passing day the charming little airport cottage—a big selling point for the package deal—felt more and more like a prison cell to her. Not only was this costing her a fortune, but she wasn’t having any fun, and learning to fly, while sometimes challenging, should always be fun. In the end, the S.O.B. didn’t even let her solo. Watching the struggles of my two favorite student pilots, I began thinking that, even though I’m not a certified flight instructor, I could do a better job teaching them to fly than the instructors they were using. Maybe, just maybe, 34 years after I dropped out of Flight Instructor School, it was time for me to go back to school. I wonder what I did with those mirrored sunglasses?